This article will tell the solution when there is not enough space available on Windows Server 2008 disk partition (system partition or data partition). Download IM-Magic Partition Resizer Server to shrink and extend volume when there is not enough free space on Windows 2008. Windows Server 2008 "Disk Management" has a cool feature which allows you to shrink a volume to squeeze some free space and then add the free space to another partition that is has no available space, but you may receive a message that "there is not enough space available on the disk to complete this operation" when you shrink or extend a volume. In this situation, can you still squeeze free space and extend the volume that is lacking free space? The answer is yes! You can use professional partition software IM-Magic Partition Resizer Server, which enables you to shrink and extend volume effectively and easily. You need to move the unallocated space close to the partition that needs to be expanded. Then, right click this partition and choose "Resize/Move" option. If you receive message "there is not enough space available on the disk (s) to complete this operation" when resize disk partition on Windows Server 2008, probably the partition doesn't have enough free space. 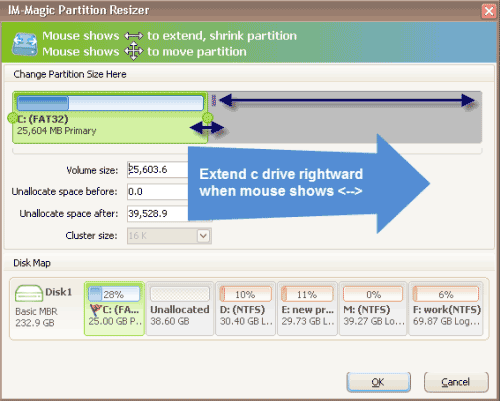 IM-Magic Partition Resizer Server allows you to shrink more than one partition to squeeze unallocated space. For example, if you need 10GB free space for C drive but you just squeeze 8GB free space from D drive, you can run IM-Magic Partition Resizer Server to squeeze another 2GB free space from another partition like E drive, F drive, etc. Then, you can move all free space together and add it to the partition you want to extend. The other point you need to pay attention to is that you can only squeeze free space on the same hard disk. You cannot move free space from another hard disk. The professional partition software has the function of resizing C drive when it is running out of disk space on Windows Server 2008. You can move free space from any partition on the same hard disk so as to get C drive partition extended easily. This partition software enables you to extend C drive when Disk Management pops up message similar as what mentioned above and cannot help you resize the disk partition. You can resize C drive without reinstalling system or rebooting your computer. In addition, this partition software does no harm to the disk data or operating system when resizing the hard disk. What is more, this partition software provides safe method to help resize disk partition even when the computer turns off due to unknown reasons. * Hard disk runs on low disk space on other Windows Servers like Windows 2003 R2, windows 2012, Windows SBS 2003, Windows Server 2012, etc. 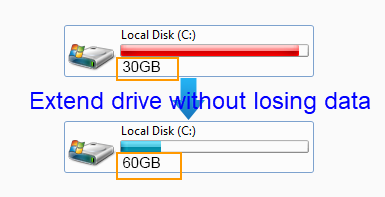 Why Disk Management Cannot Extend Volume? When you want to extend a volume, unallocated space is always needed. You can shrink another partition to create some unallocated space.